A champion gymnast learns that healing for her troubled relationship with her father takes more than hard work and determination. An excerpt from a new book, Growing Together in Forgiveness. Gymnastics is a sport of elegant grace, intense focus, and physical endurance. Watching young gymnasts tumbling and catapulting through the air is like watching birds in flight. That’s what Kim Anthony thought when she first saw the summer Olympics as an 8-year-old. Kim was born in the poor section of Richmond, Virginia. Her parents had a rocky relationship, but they loved their baby. The army took them to Germany for two years where Kim’s father and other black soldiers suffered racial abuse. To cope with the taunting, he and his friends began abusing drugs and alcohol. Even after returning home to the United States, he continued this lifestyle. In kindness, God provides touches of comfort and hope for those who cry out to Him. For Kim, that hope often came through her grandmother, Justine, who loved Jesus. While Kim’s father drifted in and out of her life and her mother worked multiple jobs to provide for the family, Grandma Justine provided a measure of peace and stability to Kim’s life. Then dawned the summer that changed Kim’s life. Watching the Olympics on television, she was captured by the sport of gymnastics. The control, the freedom, and the power of the athletes spoke to her. She longed for what she saw, young women with total control. Lonely from her daddy’s absence, Kim felt gymnastics would make him proud of her and maybe he would love her more. Kim began practicing what she’d seen on television. By jumping off the steps of her house, learning to balance and twirl on top of a concrete block wall, and practicing cartwheels, flips, and aerials (a cartwheel using no hands), Kim taught herself gymnastics. She was fearless. One Saturday morning two years later, Kim and her mom rode the city bus to a training gym where Kim could finally receive real lessons. The coaches were astounded at what this child had taught herself, all without the safety of mats and spotters (people who help gymnasts avoid injury while practicing). Kim was delighted when the coaches offered her an invitation to join a competitive gymnastics team. Kim started intense training, and her mother took on an even heavier workload in order to pay for the lessons and competitions. In her heart Kim hoped to win her daddy back to their family. Sometimes when he came home, Kim felt nervous, but she also eagerly wanted him to stay. Then, after a few days he’d abruptly disappear, leaving her feeling abandoned and confused again. And her hard-working, patient mother never said a negative word about him. Kim achieved success. She won state, regional, and international meets, and eventually—at age 16—competed for a place on the U.S. Olympic team. When the time came for choosing a college, she was offered a scholarship to join the UCLA women’s gymnastics team. While attending UCLA, a friend talked to her about a relationship with Jesus Christ. It was Jesus, Kim realized, not success in gymnastics, who could give her peace. She gratefully welcomed Jesus into her heart. College brought more medals as Kim became the first African-American UCLA gymnast to become a four-time national champion. She traveled around the world with Athletes in Action competing and speaking. But the most important competition for Kim during those years was the one for her heart. Who would control her heart and life? Whose will would she follow? Kim was learning that she must ultimately please Christ, and He wanted her to love her father and forgive him, even though he had hurt her greatly. In 2009, Kim, now married and the mother of two boys, traveled back to Virginia to meet with her father. She told him how she felt as a little girl and how badly she missed his presence. Through tears she spoke of her love for him, and then said she forgave him for his poor choices. Because of Jesus her new purpose in life included following His teachings in the Bible. Kim understood that forgiveness was a choice. Forgiving was a gift of love that changed Kim and gave her a new relationship with her father. Fathers and mothers are imperfect people; they make mistakes that sometimes hurt their children. Forgiveness is the healing medicine for all families. What can we learn from Kim’s story about the power of forgiveness in her life and in her father’s life? Have you ever been angry at your mother or father for a mistake they have made? What is the best way to talk to your parents about that hurt? Perfect Father, help us who are parents to confess our mistakes to our children. 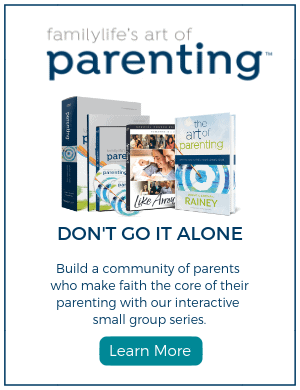 Help us teach and model forgiveness as a family. Help each of us, parent and child, put our hand in Your hand so that You might be our guide in life. When we walk closely with You we will learn to forgive freely, graciously, and generously. And when we do You will smile. Amen. Adapted from Growing Together in Forgiveness, ©2012 by Barbara Rainey. Used with permission of FamilyLife Publishing.